Mumbai, India, circa 2009. The fifth most populous metropolitan area in the world with 19 million people. Within this urban crunch are the hundred of thousands of office workers whose stomachs rumble at lunchtime. 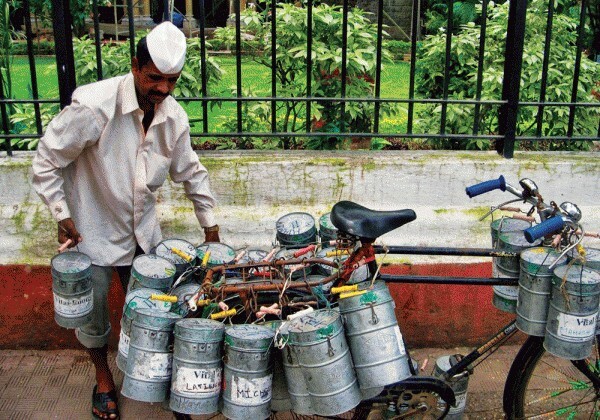 Instead of trying to find a meal in the limited time of a lunch hour amidst the crush of people, they employ the services of the dabbawala (Marathi for “lunch box man”), an elite squadron of between 4,000 and 5,000 individuals who form a citywide food-delivery web. According to the company, The Bombay Tiffin Box Suppliers Association, they deliver between 175,000 and 200,000 meals a day. In its 125 years of existence, the company has maintained an obsession with perfection. According to a company survey, there is a mistake in one of 6 million deliveries. This translates into about one mistake a month. Major corporations the world over envies the successes of the dabbawala and would kill for insights into how it is done. But it is less of a list of adages, company memorandums and seminars and more of a confluence of circumstances. The reason for such success may be familial. 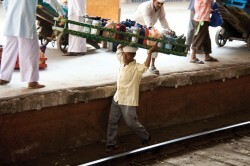 According to an article about the dabbawala in The Economist the region in Western India from which almost all dabbawala hail from was the home of warrior king Shivaji Bhosle, “remembered as a tactical genius as well as a benevolent ruler.” Bhosle’s success and abilities must have made him a strong influence on his soldiers, subjects and their descendents. Furthermore, each dabbawala isn’t a mere employee, but a shareholder in the organization, thus they are all equal in status. The dabbawala service’s swift machinations, and distinctive white uniforms, are a ubiquitous sight on the street of Mumbai, even in the sometimes-extreme Indian monsoon weather. This is how the food flows amongst them: It is prepared in various locations ranging from catering establishments to private homes and gathered by a collecting dabbawala, usually on a bicycle. Then, all of the boxed lunches are gathered together, color-coded and sorted. Then the sorted bundles, each marked to indicate the delivery location, are loaded onto the appropriate train. When each bundle reaches its destination, a local dabbawala delivers them to the appropriate address. Then the empty boxes are gathered to use the next day. All of this is done for a nominal monthly fee. And the food? It is a direct response to the Indian aversion to western-style fast food, homemade (or quasi-homemade) and fresh daily, it arrives warm and ready to eat.